My previous trips to Malaysia and Sumatra had well and truly pulled me in to the world of Southeast Asian reptiles and amphibians, so as the UK ecology season moved into hibernation Paul and I decided that a short herping trip would again be necessary. 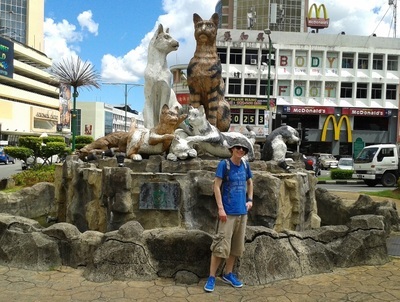 I decided on revisiting Sarawak as I would be able to maximise my searching time around places I’d visited before. 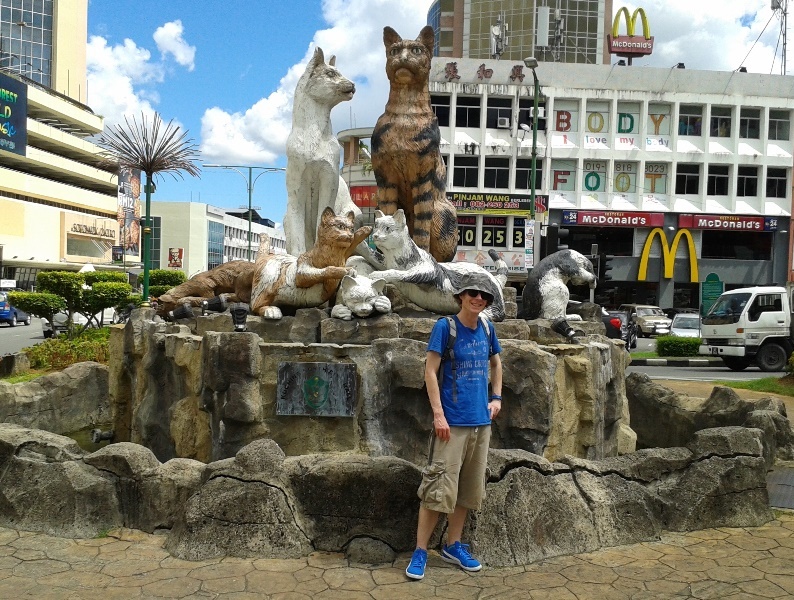 Additionally, Kuching is a pretty chilled-out place so returning here was an easy decision. 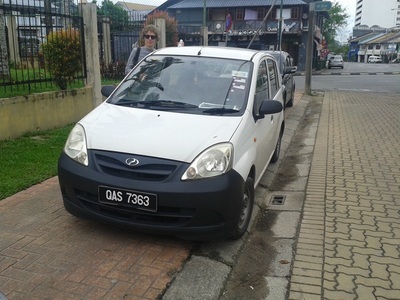 After a solid 12-hour flight from Heathrow to Kuala Lumpur followed by a shorter hop to Sarawak, we picked up our hire car, a mighty Perodua Viva (and learned that the passenger door could only be opened from the inside or via an open window), and headed into downtown Kuching for some much-needed noodles at the waterfront. In the last hour of daylight we headed off north to find some places to road cruise ready for nightfall. There was little to be seen for the first hour or so, save for the encroaching lightning which threatened to curtail our evening. Our only reptile turned out to be a DOR juvenile reticulated python (Python reticulatus) along a dirt road, as always such a shame to see a beautiful creature end up like that. This guy would surely have been a ‘trip-maker’, so to come so close was agonising. Shortly afterwards we were bombarded by some serious rainfall and with no end in sight we decided to call it quits for the night. 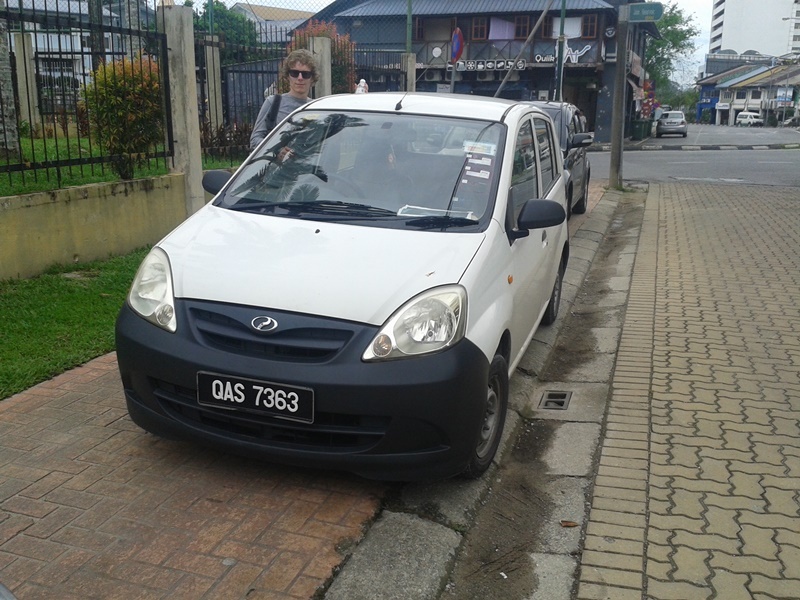 We retreated back to Kuching, the waterlogged roads no match for the Viva’s superior traction. 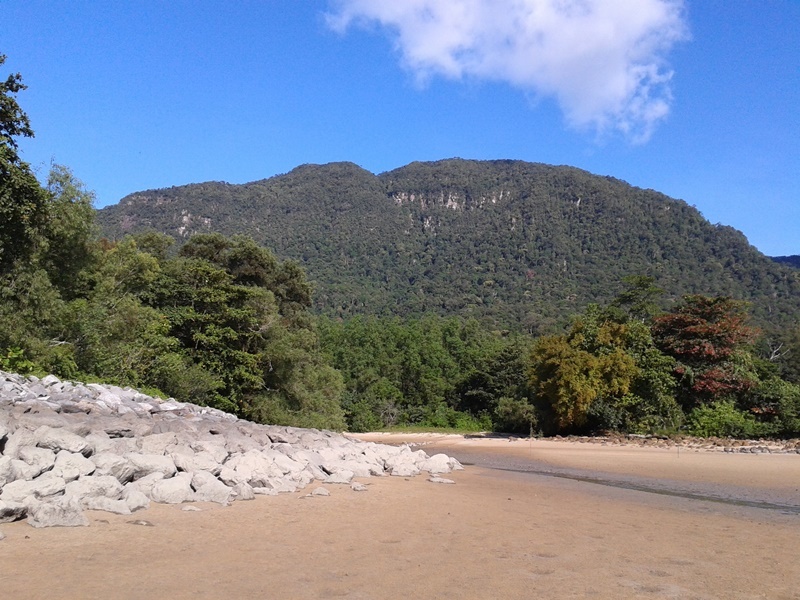 The following day we stocked up at a local supermarket (spending easily enough to put their children through college) and headed out west for Kubah National Park where I had found some success during a previous trip. In the late afternoon we scoped out a couple of off-piste routes on our way to the infamous frog pond, arriving at the shelter just in time for more torrential rain that would persist until after 8pm. After retreating back to our lodge during a slight lull in the rain, we (I) rustled up some fine noodles, checked our batteries and headed out for the night. One thing that Kubah guarantees is frogs, and this remained true from the onset. Following the road up towards the frog pond our frog and lizard counts began to rise, and we even managed to spot a freshwater crab in a stream en-route. On past the pond we found our first snake of the trip, unfortunately it was about 50ft above us and virtually un-photographable. 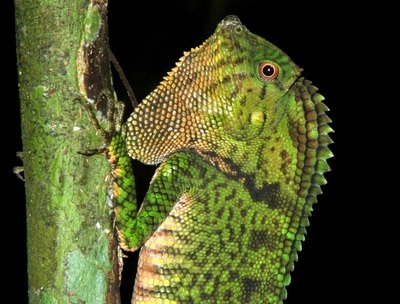 It was clearly a viper, with a still image from a zoomed-in video suggesting it was Tropidolaemus subannulatus. Our wanders continued back down towards the park centre, out of the gates, then back along the ‘Belian trail’, returning to the lodge with no further snakes just before 6am…frustrating stuff. 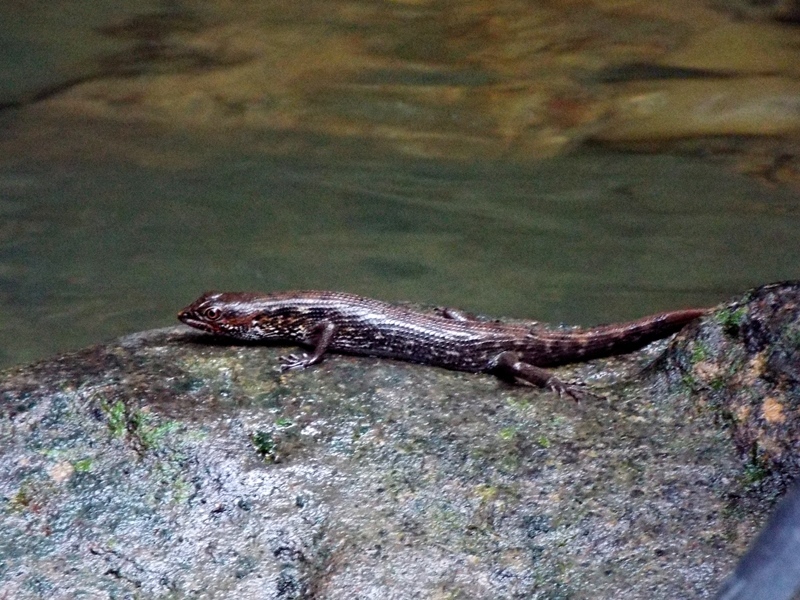 During daylight hours (or at least what we saw of them) we walked to the waterfall, spotting some water skinks (Tropidophorus brookei) and angle-headed lizards on the way before once again being met by copious amounts of rainfall. Staying remotely dry or even damp was not an option and we plodged back in total wetness hoping we’d be able to get out during the evening. An hour earlier than the previous night the rain stopped and we headed out, finding a bent-toed gecko, more frogs and an interesting spider early on. More geckos followed, along with a saffron-bellied frog (Chaperina fusca) in an old bucket before we finally spotted some shiny yellow snake coils hanging in a low tree by the path. Seemingly one of the more bite-happy snakes out there, this stripe-tailed bronzeback (Dendrelaphis caudolineatus) was no exception. 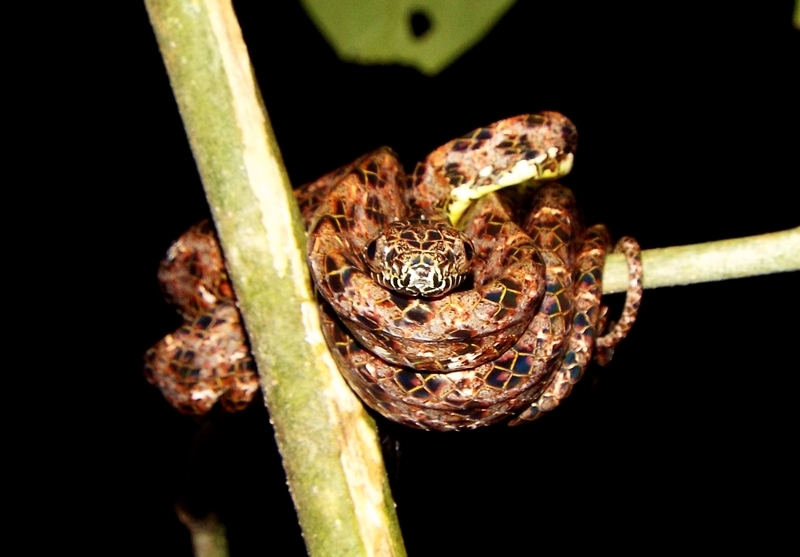 We then headed to some of the off-piste routes we’d scoped out earlier in our stay, splashing our way up various streams until we had our second snake of the night, this time a Jasper cat snake (Boiga jaspidea) found on a thin branch curving over a stream. A pretty nice way to sign-off our second night of searching. Day three was spent further exploring some of the routes away from the main road and paths to give us a greater search area during the night. Luckily the day (and night) was free from heavy rain, the streams remained walkable and we were able head out further into the forest. 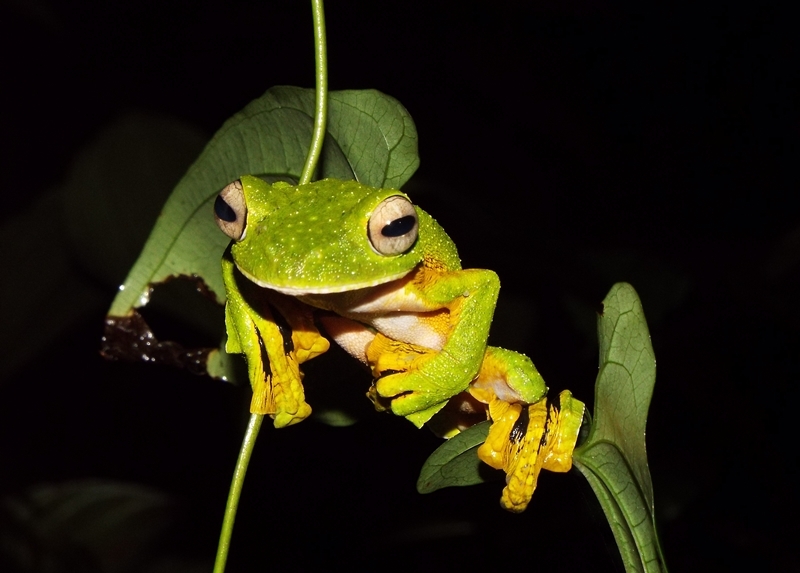 Again, frogs were plentiful, as were invertebrates including a number of large stick insects. Some notable mammals included a slow loris, a civet and a big white moonrat. Remarkably, we found a second Boiga jaspidea along a different stretch of stream, this one less active than the previous. Despite the many hours we’d put in, the actual paved road running up through the park hadn’t provided much at all, so it was with great surprise that right at the end of the night we found an unlikely candidate lying on the edge of the road, an oriental vine snake (Ahaetulla prasina). 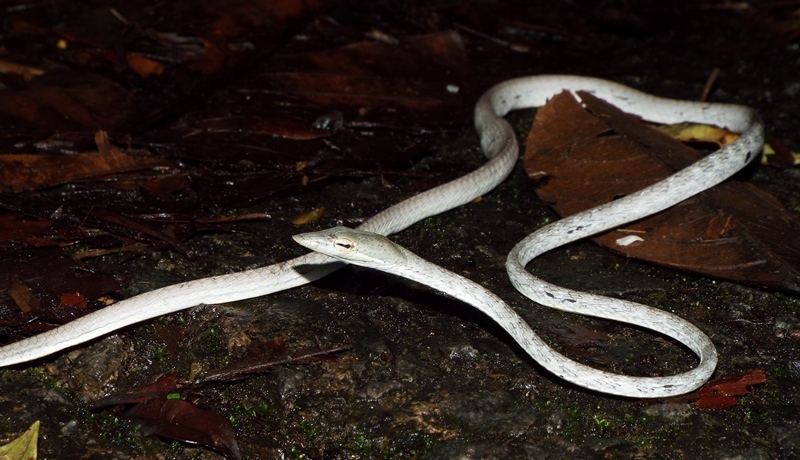 This was yet another colour in the range of A.prasina, a greyish morph which appeared bright white under torchlight. That would be our last action at Kubah as our attention would shift to some more road cruising and a couple of trips further from Kuching. The Perodua Viva roared into action the following morning, eating up the road to Kuching then onwards towards the Damai peninsula (unfortunately no Cerberus rynchops en-route) where we stalked around some mangroves (where my mosquito bite tally was tripled at the very least) and scoped out some decent-looking roads ready for the evening. However, that night the roads only produced frogs and after an hour or so we headed back towards Bako. Another hour or so passed and I couldn’t really imagine seeing anything on the road. Then from nowhere we saw a large black and white snake lying fully stretched on the road, its head raised and alert. Paul was first out of the car and ran around behind it to deter it from fleeing. I got out of the car. The krait looked at us and we looked back at it, unsure of what to do next. Before I could contemplate getting the camera, the banded krait (Bungarus fasciatus) had decided enough was enough. It turned swiftly and began to weave through the thatch of the roadside grass. A couple of attempts to stop its escape with the hook were futile, and as quickly as it appeared it had vanished. An all-too-brief encounter. It wasn’t until around midnight that the next bit of excitement arrived. By this time of night the other traffic had all but disappeared and we were trundling around at a stately 20kph, claiming the centre of the road as our own when a long, slender shape slowly passed the road in front of the Viva’s intense full-beams. 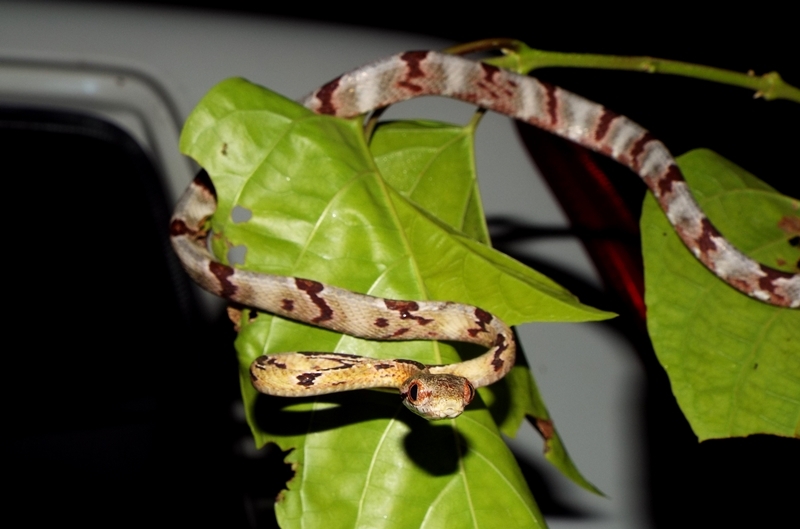 We leapt out of the car to find a juvenile dog-toothed cat snake (Boiga cynodon) waiting for us. I’d only ever seen a few images of this species and was blown-away by the delightful red colourations present in juveniles. It proved to be a bit of a nightmare to photograph (but that’s par for the course with my auto-focus brick), but eventually I got some shots worth keeping. I knew it couldn’t be my most-wanted, a Boiga dendrophila, as it had just seemed like a brownish snake that I’d passed. As I neared and saw a familiar pattern slowly moving along the road I realised we’d got a live one this time – a beautiful reticulated python (Python reticulatus). After we’d removed it from the road and taken a couple of photos, we looked to find a branch or something to pose it on. Finding a stone around 40 metres up the road, Paul took the python as I took the Viva, completely unaware that I’d left my camera on the roof. Luckily, the Viva’s usually impeccable acceleration hadn’t kicked-in, which meant that the camera stayed put and I was able to use it for a few more photos before we set the python on its way again. 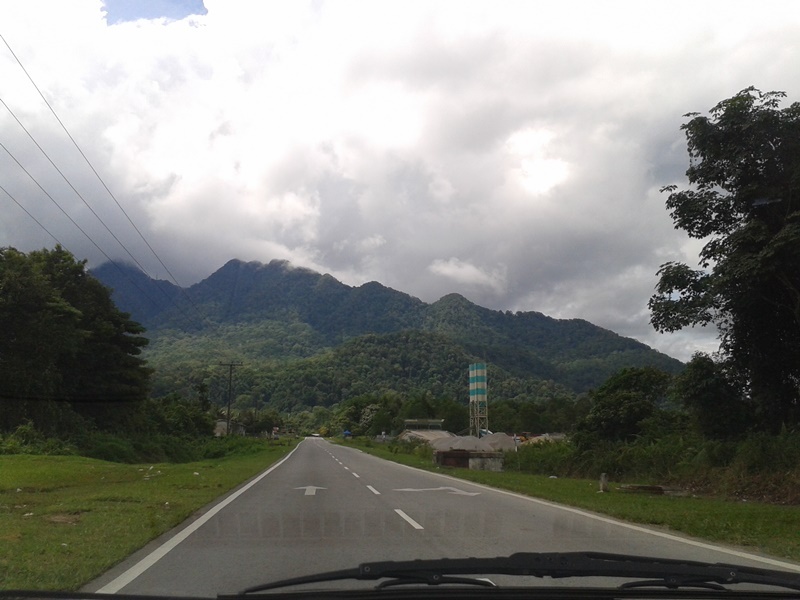 Our final day in Sarawak involved a road trip to some caves to the west of Kuching. Fairy Cave was our first stop, where we found many bats, a large millipede and lots of rainfall. Following this was Wind Cave, home to even more bats and a couple of herps. And with that professional exchange of words, Paul held my arm as I leant out from the boardwalk to retrieve species number eight of our trip, a blunt-headed slug-eating snake (Aplopeltura boa). Disappointingly, that evening’s road cruising found only one DOR snake, a common pipe snake (Cylindrophis ruffus). A few other cars seemed to pass us more than once doing similarly stately speeds, so I guess the word is out about cruising these roads. We called it quits shortly after midnight and prepared for the morning’s flight to Kuala Lumpur. Back in Peninsular Malaysia, we waited outside our hotel to meet with Kurt and his friend Hien, who were right on time at 6pm to take us off for an evening of herping an hour so outside of KL. It rained a lot on the way, and maybe even more so during the first hour. Whether or not this affected the resident snakes I don’t know, but it was pretty slow-going species-wise. 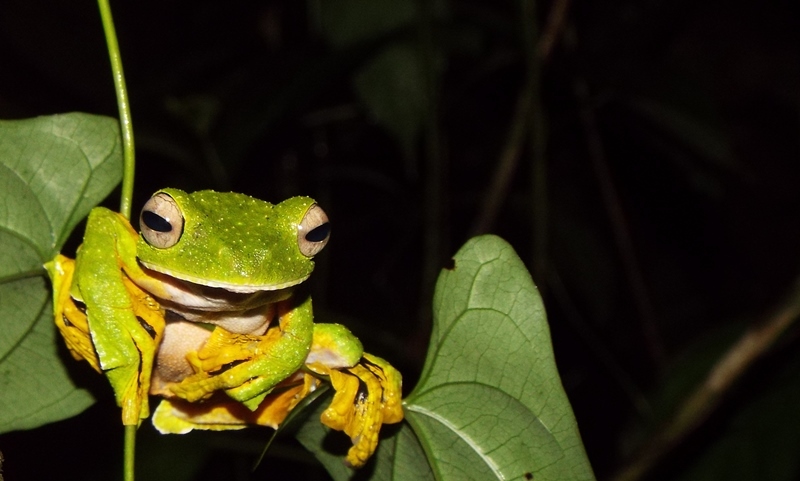 Luckily we managed to find a few individuals of a frog I’d always wanted to see, Wallace’s flying frog (Rhacophorus nigropalmatus), so that helped to keep my spirits up. I’d say we were just about on the four-hour mark when Kurt rescued the evening, spotting a few seriously solid coils around a 7ft-high branch just off the track. We couldn’t see its head at first, but looking at its tail and ventral scales we were pretty sure we had a keeled rat snake (Ptyas carinata) on our hands (well, almost). After a couple of in-situ photos it began to stir and lifted up its head, revealing its large eyes and confirming our thoughts of P.carinata. Just as I readied to bring it from the branch, some ‘protective’ gloves were thrown in my direction. I put them on just as the huge mass of rat snake threw itself from the branch. Gathering a good metre or so of snake in my arms, I carefully secured its head and ensured the gloves wouldn’t have to be tested that night! After a couple of photos we took it to a clearer patch where Paul, wearing an unbelievably motion-restrictive poncho, managed to calm the snake for a couple more photos before releasing the beast back into the night. 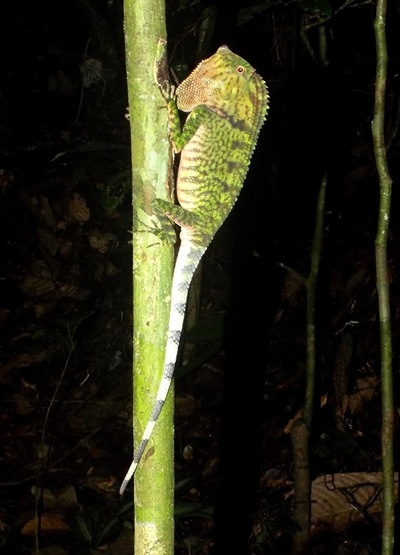 Returning to the car we found an amazing leaf insect, a sleeping painted bronzeback (Dendrelaphis pictus) and Kurt found potentially the largest frog I have ever seen. From then on the evening became a leech-removal exercise, with Hien and Paul clearly coming off worst. At this point I’d like to say thanks to Kurt and Hien, it was great to get out and explore with the two of you!